This is the Burns plaque, featuring ‘poetry’ of his usual quality. It takes a while to gain any height, but when you do the views back over The Cheviot are quite something. Coldstream Bridge from the riverside path. Well, actually from one of the numerous salmon fishing paths that repeatedly lure you off the main footpath. Cessford castle – most picturesque. Being English I had absolutely no intention of reciting poetry at this point. I just took a selfie. This is, seriously, the path. A week or two later you’d have explosive seeds in every crinkle and orifice, which is not always a pleasant experience. Hiker’s hotel room – before. Pixy bridge by Kirk Yetholm hostel. A quite moment in the very friendly Mason’s Arms, fishing rods on the ceiling. The St Cuthbert’s Coffee Stop. I can imagine a seventh century ascetic would have been pretty glad of a cappuccino. Norham Castle, spectacular location of many a desperate and bloody struggle in the bad old days when this was The Most Dangerous Place in England. Norham’s Norman church is worth a look with its massive graveyard and interesting Anglo-Saxon carvings. The mighty Tweed, shortly before it becomes obviously tidal. To get across the River Till you have to head up onto the impressive old viaduct. St Cuthbert’s Chapel is just left of centre, in the ploughed field. It’s astonishing how much incredible civil engineering is now just standing around virtually unused up here. Having survived the Pennine Way it’s a surprise to find that a stroll along a riverbank at sea level can be genuinely hazardous. That vegetation disguises a vertical drop into a deep and massively powerful river. If you slipped on the wet grass while walking alone and wearing a heavy backpack, you would drown. The first section along the A698 isn’t too bad to walk along as there’s a wide grass verge. Subsequently it gets scarier. Randomly, I plumped for the Old Railway option. I now think Borders Abbeys Way via Riverside would have been nicer and more interesting. 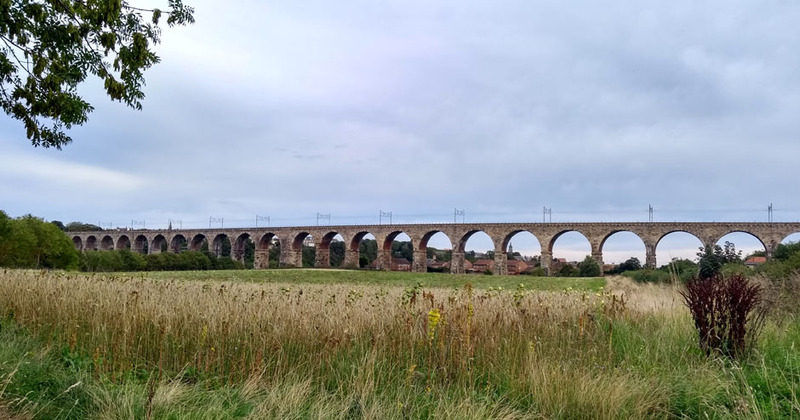 Crossing Roxburgh Viaduct. Yellow arrow shows the Borders Abbeys Way along the river Teviot which with hindsight I think would have been a better choice. Pretty much all old chapels in these parts seem to be called St Cuthbert’s and this one is no exception. The Scots love their satellite treevee. The fruit in the hedgerows was astonishing. The unprepossessing portal, through which on my very own feet I’d set out upon this very trail, all the way to Cape Wrath. I found it hard to turn away. Yummy-looking edible fungi were everywhere, if only I’d had some butter to cook them in. Stating the obvious, please don’t eat wild fungi unless you’re 100% sure they won’t kill you, because some of them will. This path between Kirk and Town Yetholm is the start of the Scottish National Trail. Don’t panic, it gets a lot more Scottish. Descending into Teviotdale, Peniel Heugh on the skyline. The views from Wideopen Hill would have been even more extensive two hours later! The visibility wasn’t perfect but it was still strangely moving to look back at the Yetholms nestled in their cosy valley. To the right I could see the Schil, The Actual Cheviot and Windy Gyle; literally, a whole different perspective on the Pennine Way. A view of the water gardens from the otherwise pretty useless Teviot Smokery. Slightly confusing climbing up and down around Horncliffe. That darkness below me is water. Very slippery when crushed, the Himalayan Balsam again disguises a vertical drop into the deep river. The Mighty Tweed at Kelso. Surely one can just walk along it somehow? The Union Chain Bridge, an internationally-renowned icon of civil engineering history, the oldest surviving iron suspension bridge in Europe and the first designed for vehicles. Now sadly closed to vehicles, as it’s somewhat disintegrating. The light wasn’t great, unfortunately. The friendly owner of a cottage here was very proud of his wild flower meadow. I didn’t like to ask how exactly Cosmos counts as ‘wild’ in Northumberland. I had no idea what that white W waymarker meant. It means the Borders Abbeys Way. Slightly annoying sign on far side of Kalemouth Bridge. Ah well. The not very obvious stile on the far side of the A1. Berwick beach. Yes, it has a beach! As far north-east as this walk is going to get. I don’t mind wet feet but I draw the line at the North Sea. Walking out to the pier to look for Dolphins. See that white van? The Barrels pub is just there, on that corner. After nearly three weeks of peace ad quiet I have to cross the actual A1! Help! A little further down, the river has become tidal. The riverbank starts to get a little urban in places.